If your gaming needs are a little off the cutting-edge, Linux can be a viable alternative. And it's an alternative that has many advantages of its own. There are no viruses, no wayward processes chugging away in the background, no spyware, lie-ware, trojans or worms, and you have complete control over your system. Not only has Linux become much easier to use over the last few years, it's now capable of running many of the more high profile game releases, giving you the best of both possible worlds. The switch has recently been made even more tempting thanks to the latest release of the Ubuntu distribution, an amalgam of the best open source and free software wrapped around a custom-built installation and configuration. Ubuntu is partly responsible for the incredible success of Linux since its first release in 2004. It's a distribution that focuses on normal users rather than just the uber-geeks. Ubuntu's motto is 'Linux for Human Beings', and the 9.04 release gets closer than any other Linux distribution in bringing Linux to ordinary users. It installs through a GUI, and requires very little user-interaction. The desktop is easy to use, featuring smooth transitions and bundles all the software you could possibly need. Even hardware compatibility and configuration has become largely a non-issue. If your memory of Linux is pre-Ubuntu, you won't recognise it today. The only significant problem you're likely to encounter if you switch to Linux is getting your gaming fix. With only a few notable exceptions, including the amazing World of Goo, there are very few native Linux conversions of recent games. Which leaves you with two possible avenues. You can either dual-boot Linux alongside your Windows installation, giving you 100 per cent Windows compatibility and a Linux desktop, or you can run those Windows games on your Linux desktop. The magic behind this shape shifting ability is an open source project called 'WINE'. In true GNU/Linux fashion, this is an indecipherable acronym that references itself. You see, 'WINE Is Not an Emulator'. It's developers prefer to think of it as a compatibility layer more akin to a wrapper around Windows technology that's a bit-for-byte translation of what various DirectX and Windows libraries do. WINE is a masterpiece of programming, and a major project in the world of open source software development. It enables Linux users, and other Unix-like users, to run Windows binaries from their desktop without having Windows installed or any other Microsoft files knocking around. It accomplishes this by recreating the various Windows system calls, functions and procedures without any idea of what the original Windows code looks like, and it wraps itself so tightly around its own implementations of these components that native Windows applications never have an idea they're running on WINE. And even more impressively, it can do the same trick for games. A large chunk of WINE is dedicated to recreating the intricacies of the various DirectX components, transposing graphics calls into equivalent OpenGL instructions. Audio calls into OpenAL. But WINE is able to do this with such efficiency that if your Linux system has the horsepower, you can run many modern, resource intensive Windows games and get similar performance to a native Windows installation. But WINE can be a tricky beast to tame. To get the best out of it, you'll need to resort to the infamous Linux command-line, a process that will immediately break the belief that Linux has left its geeky credentials behind. Fortunately, before you give up, you need to know that there's a better solution. It's a commercial application that costs about the same price as a new game, but packages WINE into a seamless desktop application that removes the pain from installing and running your favourite Windows games. That application is called Crossover Games and you may have heard of the Crossover brand before. 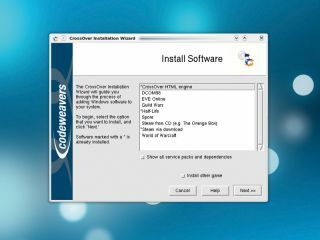 Another product, Crossover Linux, focuses on the more prosaic job of getting older Windows applications like Office 2000, Photoshop 7 and Dreamweaver MX running in your Linux desktop. The 'Games' edition allows itself to be slightly more cutting edge. Which roughly translates to 'it might crash' , and rather than losing a year's worth of accounts, you'll lose your high score in Grid Wars instead. The Games edition also enjoys a much quicker update cycle as Crossover developers try new technologies in their constant quest to catch-up with Microsoft development. If you want both application support and the ability to run games, then the Professional edition of Crossover includes 'Games' as a single package. If you think a commercial solution runs against the grain of Linux evangelism, then there are several good reasons for supporting it. First, its development directly helps WINE as Crossover's developers are WINE's developers - code created goes back to the original project. This improves WINE for free, and actually re-enforces the open source model by showing that people are prepared to pay for a valuable service. Almost all the DirectX compatibility that's currently built into WINE is thanks to Crossover Games development, and compatibility is going from strength to strength. Second, thanks to the nature of games software, Crossover is constantly being updated with new titles, and you can vote for those you want to see better compatibility for. If this were a free project, there would be no incentive for similar development, and Linux users wouldn't have such a great solution for running Windows games. And this is where hardware comes into the equation. Linux can still be picky. Good Windows games performance needs solid Linux driver compatibility, with the biggest hot spot being your choice of graphics card. Currently, there's really only one option, and that's something from Nvidia. AMD/ATI cards can be made to work, but they'll leave you reformatting your hard drive, begging Steve Ballmer for forgiveness. Either way, the latest release of Ubuntu handles proprietary driver installation automatically. After you've installed the distribution and booted into the normal desktop, Ubuntu will detect whether you're using hardware that could benefit from a proprietary driver and ask whether you want to proceed. This is necessary because Ubuntu is predominantly open source, and that means the code for all the software can be freely modified, and freely distributable. Nvidia and AMD's drivers are not, and as a result, their stability is out of the hands of the Ubuntu developers. The good news is that you shouldn't have the same problem with audio hardware, as the vast majority of modern devices will work from the first boot. Things are slightly different when it comes to controllers. Linux isn't a popular gaming platform, and as a result, controllers that aren't a keyboard or mouse are poorly supported. You'll find that many Logitech joysticks work, for example, but a steering wheel is unlikely to be functional. There's no custom calibration tools and no button configuration utilities either, and feedback is always hit and miss. You might think that you could simply install the Windows drivers and tools through Crossover, but this won't work. Your stick either will work or it won't, but that doesn't mean you shouldn't give it a go. If you're after a quick and cheap solution for arcade titles, then console controllers work well with a corresponding USB converter, and that's probably the best way to proceed if you need to use a controller. It's also worth noting that, unlike Windows, the 64-bit versions of distros like Ubuntu won't hold you back in the compatibility terms. A 64-bit install can obviously take advantage of more memory, as well as running more efficiently, and both WINE and Crossover will run 32-bit games and applications from a 64-bit desktop.